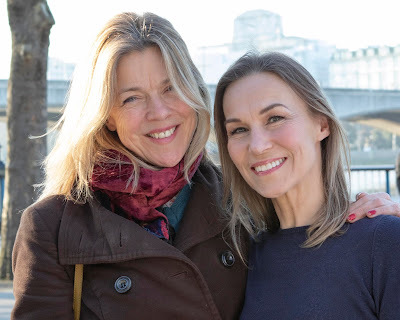 In just seven days it has been possible to catch the RSC doing what they do best - offering an insight into Shakespeare’s profound understanding of the breadth of the human condition. At Stratford last week Titus Andronicus evidenced man’s capacity to wreak bloody revenge. This week with The Tempest, we observe the power of forgiveness. In a literally magical production, the London transfer of Stratford upon Avon's 2016 hit sees Simon Russell Beale as Prospero shipwrecked on an enchanted island in the Med, with only his daughter Miranda to accompany him and a library of books and spells. Also resident on the island are Caliban, a hulkingly ugly witch’s son and Ariel, a spirit, both of whom are under Prospero’s spell - and as the (literally fantastic) story unfolds we learn of Dukedoms usurped, resentments nurtured, smouldering love and passionate jealousies. What makes Greg Doran’s production soar is a virtually seamless marriage of some of the finest acting to be found, alongside breathtaking 21st century technology. Stephen Brimson Lewis’ stage design is magnificent - the entire play taking place within the massive gaping ribs of a shipwreck’s hull. Onto these perished timbers, The Imaginarium Studios and Finn Ross project digital creations which through a combination of both ingenious imagery and the screens onto which their work is projected, breathe a supernatural life into the island. 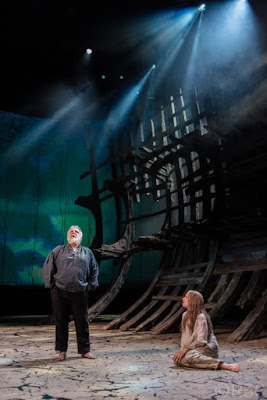 Russell Beale’s Prospero is wise and measured, with the actor’s hallmark twang of wry exasperation giving a lilting cadence to some of Shakespeare's most beautiful verse. Jenny Rainsford as Miranda is a young woman brimming with desire. Her joy on first encountering the subsequently shipwrecked Ferdinand, the King’s son played by Daniel Easton is almost palpable and the love that evolves between the couple, albeit within the confines of a tale based on magical whimsy, is entirely plausible. As the grotesquely piscatorial Caliban, replete with flapping fish, Joe Dixon’s spinally exo-skeletal costume could almost have been designed by H.R.Giger. Dixon captures Caliban’s slow-witted complexities perfectly, while as Ariel, the bodysuited, lithe Mark Quartley turns in a performance that is as acrobatic as it is stunningly empathetic. Excelling throughout, in a performance that blends bewilderingly believably into the digital domain Quartley’s understated elation as Ariel receives his liberty in the final act, is a celebration of sensitivity. While all of the performances are spot on, there’s a niggle in the casting of Jonathan Broadbent as Antonio. He may well be Prospero’s brother, but the significant age gap between the performers makes that particular conceit hard to grasp. There must however be a mention for the outstanding soprano work from Elly Condron, Jennifer Witton and Samantha Hay as Iris, Juno and Ceres respectively, who only add a further degree of enchantment to the consecration of Miranda and Ferdinand’s union. Paul Englishby’s music and Lucy Cullingford’s movement alongside the production’s stunning sound and lighting only add to what is yet another work of excellence from the RSC.